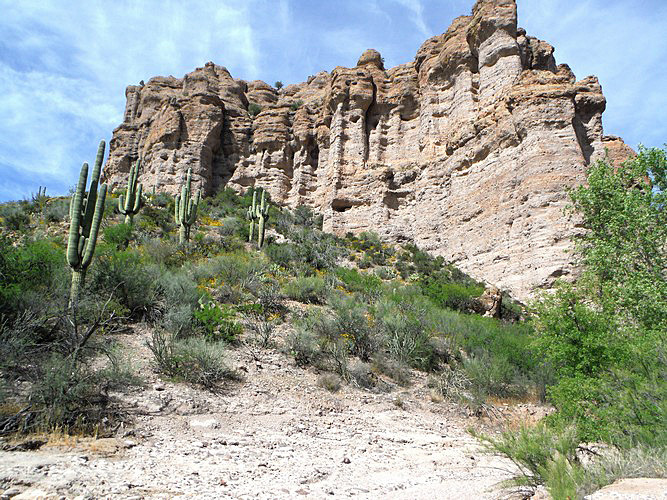 The Aravaipa Canyon Wilderness is located in central Arizona between the towns of Winkelman and Mammoth. 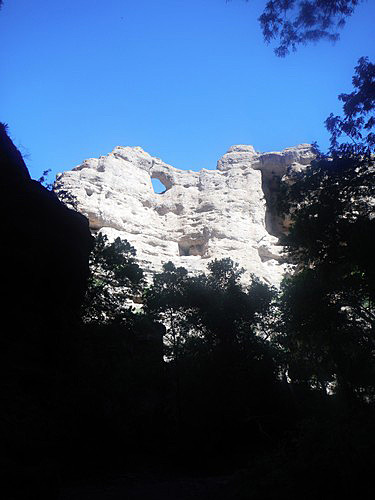 Although I had grown up in the town of Winkelman, I had never been in the wilderness part of the canyon. When a former student made the arrangements for a 3 day trek, and extended an invitation, I could not really turn down the opportunity. We entered at the eastern end of the preserve. 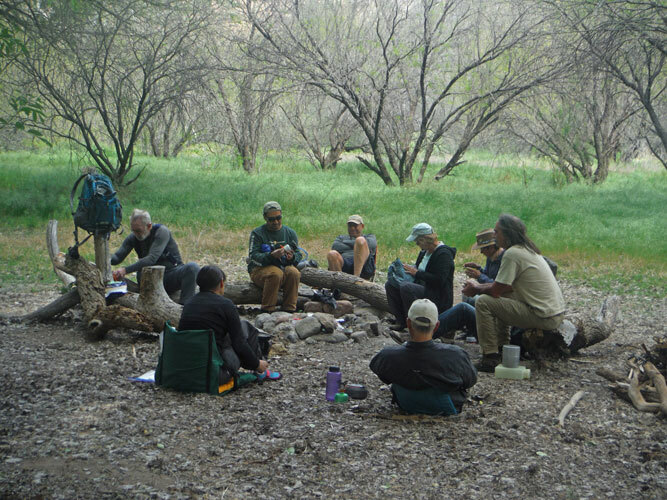 Two miles of walking were saved by driving our vehicles to the junction of Turkey Creek Canyon and the Aravaipa. 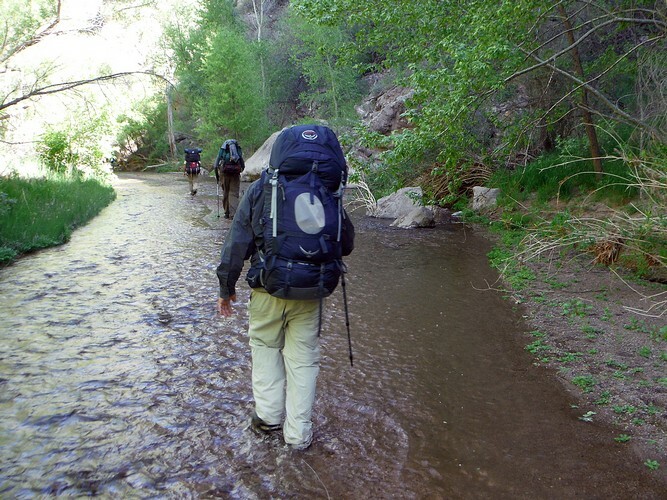 As described in many articles, hiking in the Aravaipa Canyon is wet. While we found stretches where there was a trail on one of the banks, it was often easier to just plunge into the creek bed and forge ahead. I wore an old pair of Merrell hiking boots with heavy socks. That combination worked well. 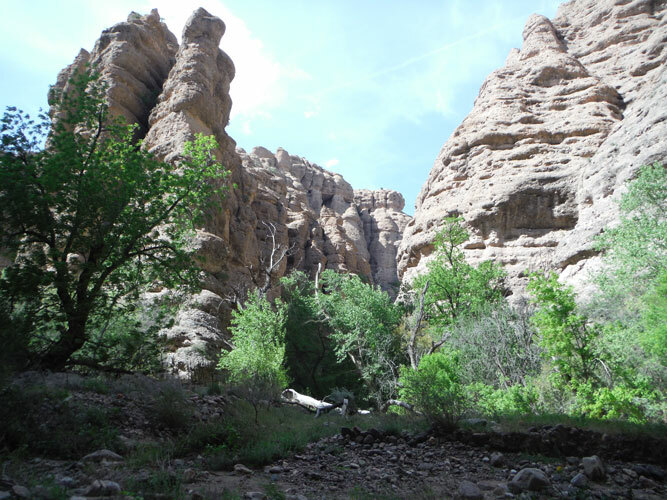 It was not apparent to me that there had been a devastating flood that had washed through the Aravaipa in 2006. The views up to the rim are supposed to be much more open now than what they had been. That was fine with me. In approximately 2 miles or so of walking, we came across a nice spot to set up a base camp. The rules permit at large camping. Campfires can be built in existing fire rings. We were good to go. This was the view of the creek from our campsite. During our stay, other camps were established both upstream and downstream from us, but those groups were out of sight and we never felt intruded upon. 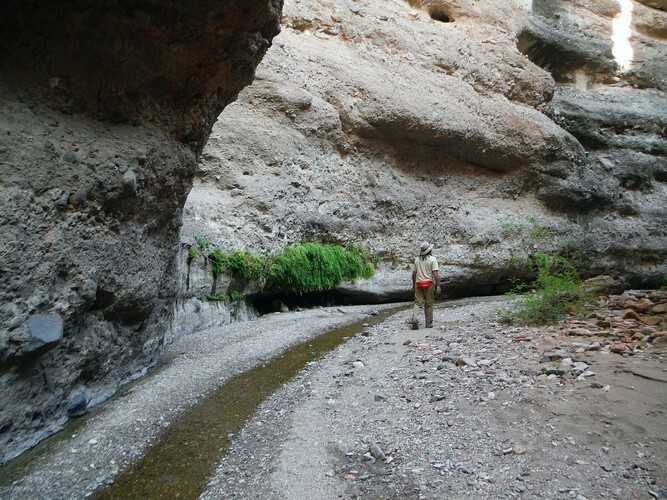 20 persons per day are allowed into the canyon from the east end of the wilderness. Our group accounted for 10 of those 20. 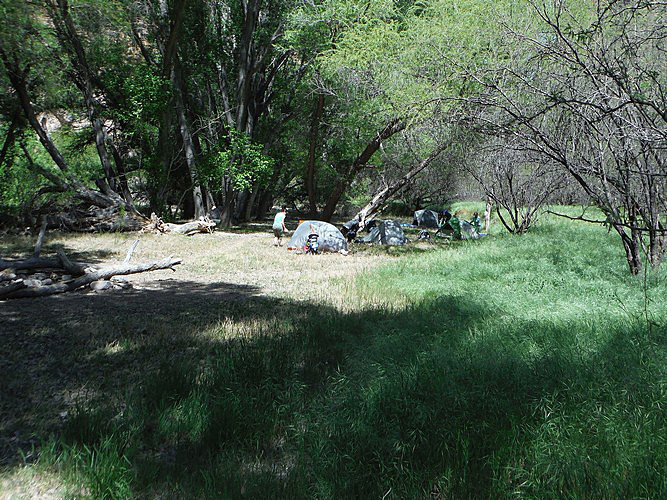 This large bluff near our campsite marked the entrance to Deer Creek Canyon. 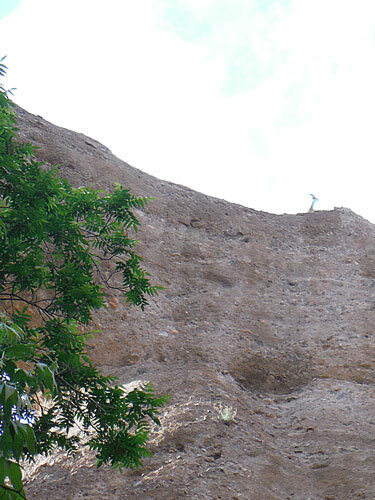 It is up this canyon that the Hell Hole is to be found. I have seen the canyon called Hell Hole Canyon, but I think the correct name is Deer Creek. The rock type of the bluff is the Hell Hole Conglomerate. It is a sedimentary rock formed from the cementation of broken volcanic fragments from the nearby Galiuro and Santa Teresa Mountains. The heights of this layer can range from 400' to 600'. This is the rock type that forms the walls of the Hell Hole. It is interesting how this rock formation erodes into both vertical and horizontal lines. 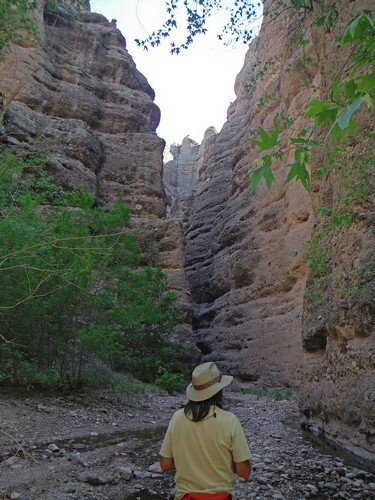 The lower stretches of the side canyon were dry in early April. It did not take long for the sides of the canyon to close in. In the most narrow sections, the walls may have been separated by only 20' or so. 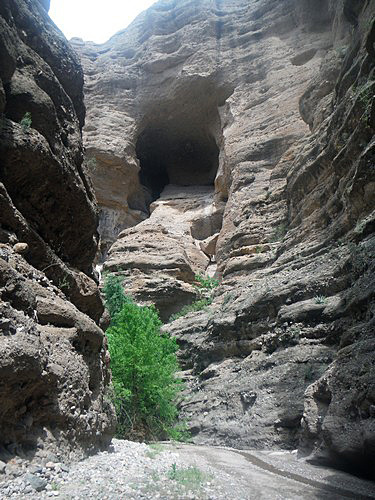 Small caverns caused by the erosion of the rock fragments from the walls were common. A narrow stream of water soon appeared in the bottom of the drainage. Hanging gardens were seen attached to the canyon sides where seeps of water managed to escape from the rock walls. 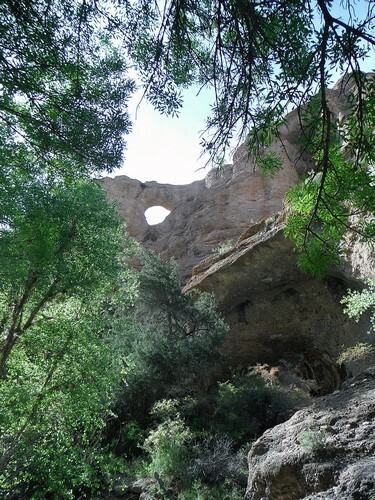 This natural arch in the west wall of the canyon is supposed to be the Hell Hole. I do not understand the association of that name to the feature. A couple of the group hiked past the arch the first afternoon of the trip and then again on the second day. 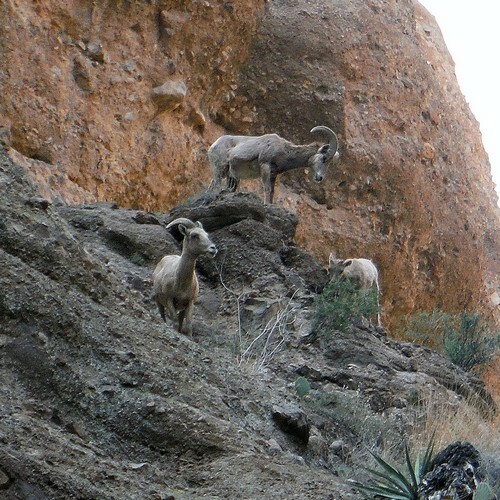 On the first walk by, a big horn sheep was spotted at the top of the arch! This was the view of the bridge in the early morning sun the next day. 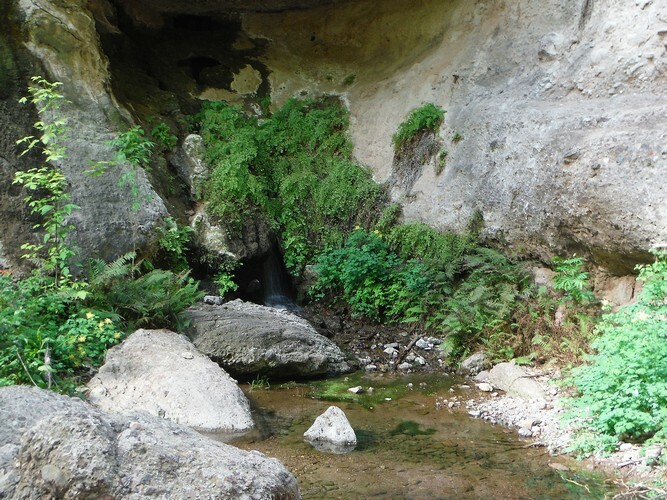 In one of the alcoves, there was much more than just a seep of water. There was a real gusher of a spring. 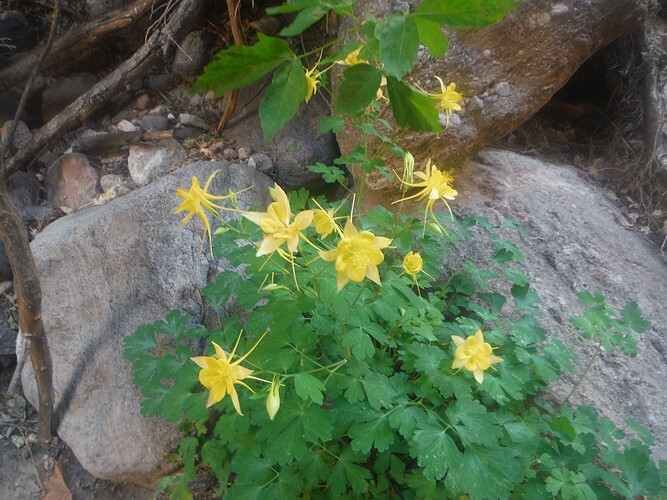 Yellow columbine flowers completed the scene around the spring. It was here that I also learned about monkey flowers. 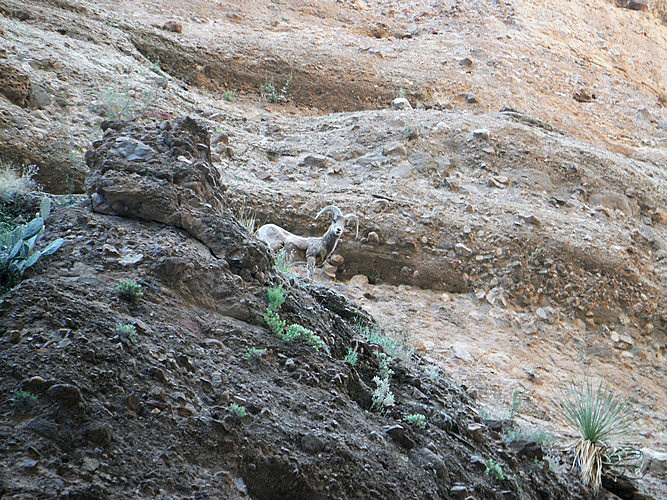 Not far on up the canyon from the spring, a family group of bighorns was spotted. There was a ram, several ewes and one lamb. The sheep did not seem intimated by our presence at all. The top photo in this report is a different pose from the ram. There was some peril to being below these animals. More than once, small rocks were dislodged down on to us. Some of those gathered quite a bit of force before slamming into the creek bed. I think that I would be more inclined to call this opening the Hell Hole. The darkness of this opening is more ominous than the bright light shining through the natural bridge. 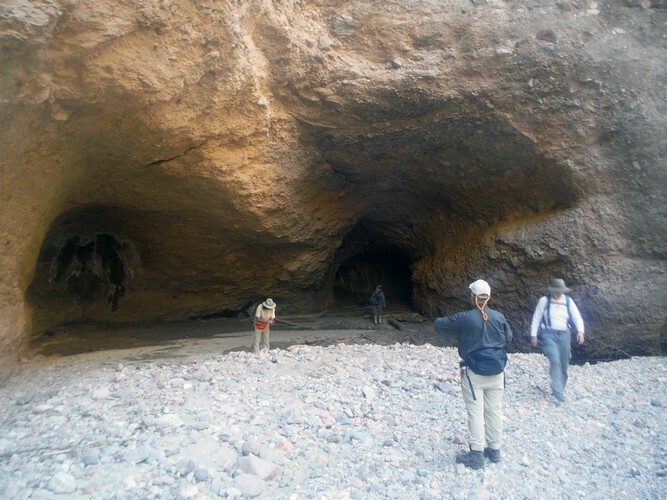 The narrowness of Deer Creek Canyon continued as the hike up canyon proceeded. .
At 3 miles or so into the walk, a series of large erosion caverns appeared. They were quite tall and very deep. Large cat tracks were found in the mud. 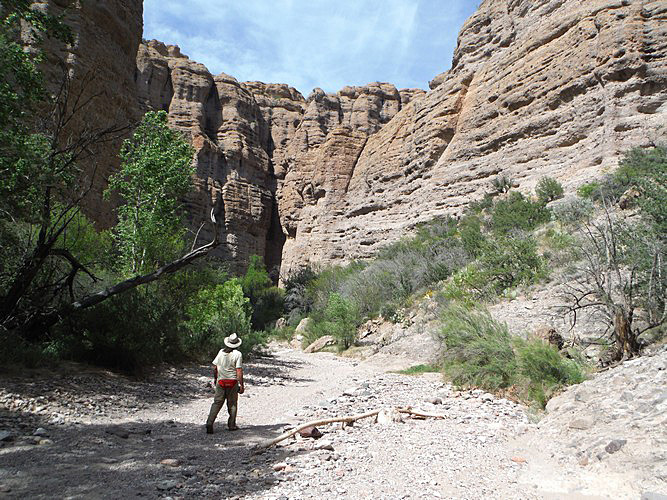 At around 3 1/2 miles, the walls of the canyon began to separate and were not quite as tall. 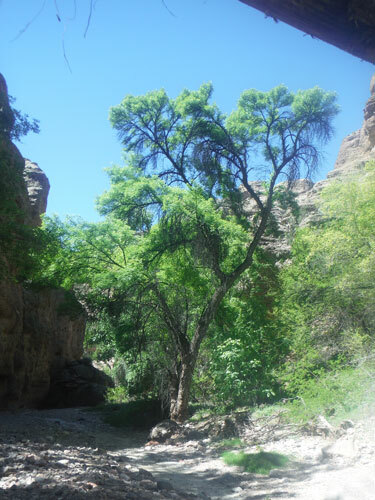 This large Walnut tree made a good turn around for the dayhike up through the Hell Hole of Deer Creek Canyon. That evening as the group set around the fire circle, it was agreed that this had been an outstanding trip. And to a person, it was thought that the trip up through the Hell Hole was what had made it so. The 3rd morning, the return to the trucks was made in short order, and the search was on to find a celebratroy beer! 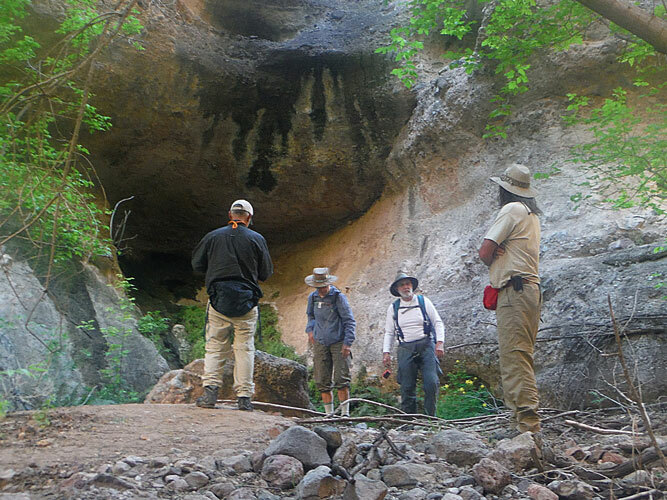 Trips through the Aravaipa Wilderness occur on a permit basis. 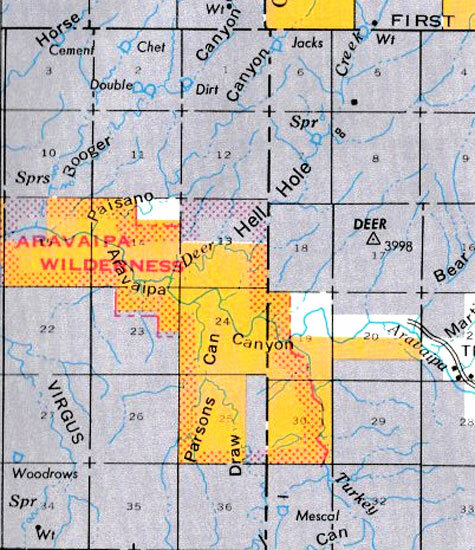 The BLM administers the area. This website provides needed information.